It was such a lovely afternoon it would have been criminal to let it go to waste. So out I went, back to Permission 1 – the barren one which makes me sweat blood for every half decent find. I had hoped to return to the field which produced two fruitful afternoons last month, but the rhea are still in it and apparently they are even randier now than they were then. I didn’t fancy my chances. As a result I decided to try a field I’ve not detected before. From the start it looked as though it was going to be a crap afternoon. Not only did I forget my flask of coffee, but Tect O Trak, the app I’m currently using on the phone for tracking my movements round fields and logging finds, decided not to work again. By far the best find of the day was a tiny hammy (12mm x 10mm and 0.32g and therefore probably a farthing), the first I have found on this permission, which came from just off a public footpath running through the farm and was about 10″ down. Well done the Deus. Presumably this is evidence of a sort that the footpath was probably being used in the medieval period if not earlier, so systematically detecting the path on a future visit seems like a good move. Unfortunately the coin is poorly struck and off centre so whether it will be possible to identify the mint and moneyer remains to be seen. I will try to upload larger and clearer images of both sides of the coin as soon as possible in the hope that someone can fully identify it. And another pewter spoon, or rather part of one. They seem to be surprisingly common on this farm for some reason. I’m starting to think of it as Death of Spoons Farm. And two lead seals – one from a case of Moët & Chandon champagne and the other probably from a fertiliser sack, though I can’t make out the name of the company concerned. I went back to Permission 1, hoping to return to the field that produced a few finds on my two recent visits. Unfortunately the farmer has moved the alpacas and rheas into it so I decided to try Field 2 which is where the animals were previously. This is a field with shallow ridge and furrow that can be seen clearly on aerial shots and more dimly on the ground in slanting sunlight. I had a session on it several years ago when it produced a George III penny and a lot of iron junk and foil. Being behind the farm buildings and where the farmer stores his machinery, I imagine a lot of scrap has been chucked away here over the years. 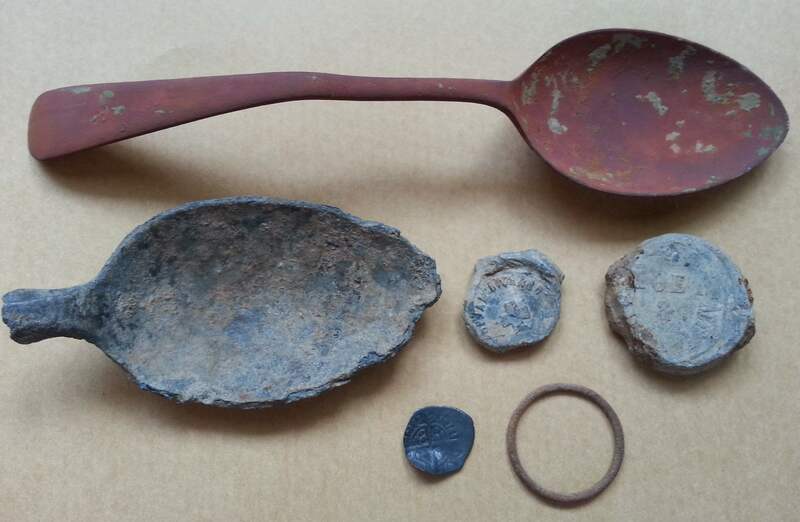 A couple of hours detecting produced 1 pewter spoon handle, a complete vaseline bottle (including its decomposed contents) and the usual collection of scraps of lead and foil and a pair of enormous iron D-rings which look like the bit of a gate that the bolt goes through. The spoon handle is rather nicely decorated in a style I think may be late 18th century or regency and has a maker’s name on the back which may be Manson or Mamson or similar. And my tracking app gave up tracking half way through the session. Brimming with renewed enthusiasm for my generally barren first pasture permission I went out to have another swing at it yesterday afternoon. The first hour was spent on a triangular field that I hadn’t tried before, criss-crossing back wards and forwards in one corner to get a flavour of what might be there. Bugger all but a few scraps of foil. So it was back to Tuesday’s field. During the course of the afternoon I tackled one area quite intensively, which produced a few odds and sods but nothing to get excited about, headed up to the top of the field in a straight line and then back across towards another landmark. The rest of the session was spent in the lower part of the field in the general area which produced Tuesday’s finds. A few bits and pieces came up, though it was not as rewarding a session as the one earlier in the week. What’s interesting is that the top half of the field, which lies above a shallow rise, produced nothing at all. The farmer has previously told me that in the past there has been some marl digging from that field, so it’s possible that any finds that might have been in that area have already been stripped away. Presumably though they should be elsewhere on the farm. 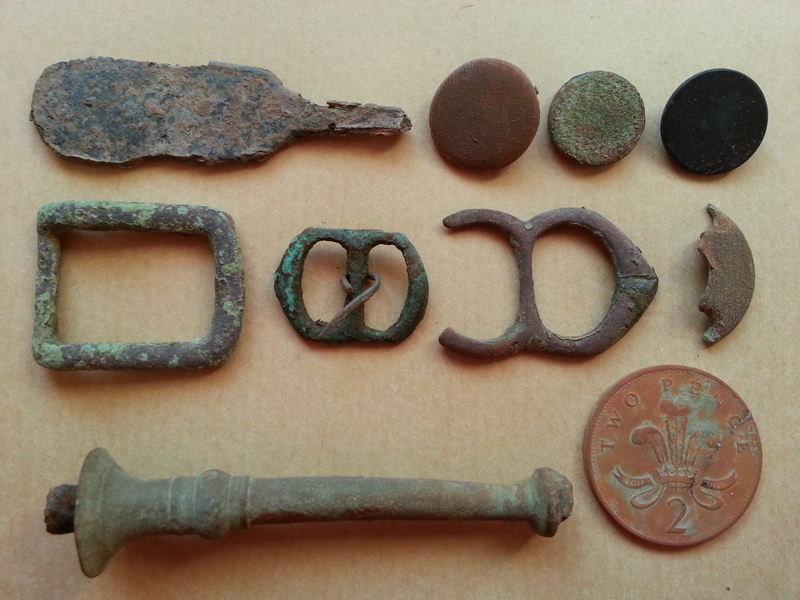 On such a glorious spring day yesterday there was no excuse for not getting out to do some detecting. So out I went yesterday afternoon. Not only was it my first detecting session since the autumn, it was the first trip back to my first, or No 1, permission in about a year. Nos 1 and 2 are pasture permissions so, in theory, available all year. However No 2 has cattle in and No 1 has sheep, and if I am to risk getting between livestock and their young I would rather it was sheep and lambs than cows and calves. To be honest I wasn’t expecting to find much at all. No 1 produced a few nice bits and bobs from one particular field when I first stated detecting there, but since then it has been pretty barren – so much so that I have toyed with simply abandoning it. Still, a permission is a permission and the farmer is happy to have me there. Part of the farm is inaccessible at present. One field that leads to several others is currently occupied by a handful of alpacas and half a dozen or so rheas. The alpacas I knew about. The rheas I didn’t. The young male rhea is apparently rather frisky at present and he and the older male have had a few set-tos recently which I didn’t fancy ending up in the middle of, so I went off to a field that I’ve detected before, albeit briefly, but which has produced only a few uninteresting finds in the past. I started by detecting along the line of a public footpath and bits and bobs started coming up almost immediately. Part of a pewter spoon, then a buckle, a button, another buckle, an iron ring, another button and so on. Over 4 hours of wandering around one end of the field it turned into the most productive session I’ve had on this farm for quite a while and makes me think that while it’s never likely to produce anything spectacular, it’s worth going back for the odd session from time to time. 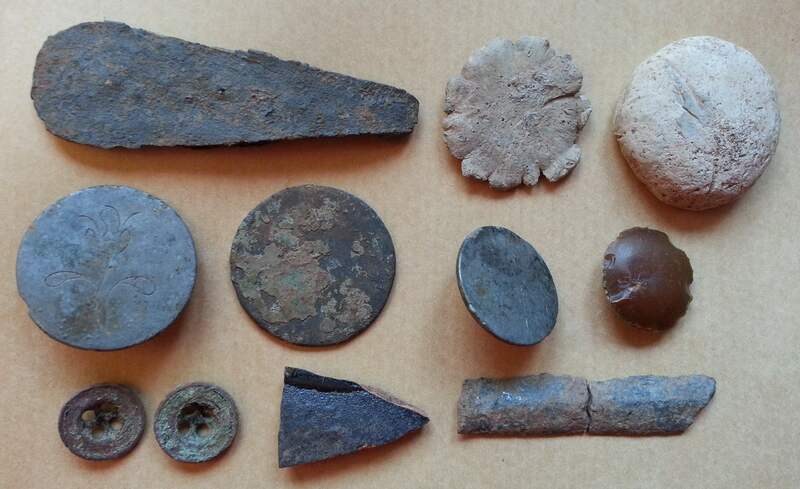 The most interesting item of the day was a long, thin, copper alloy item (at the bottom of the finds photo) which at first I thought was just a bolt, but when the mud was brushed off started to look like a pipe tamper (I’ve not found one of those so far so it would have been a first). However it has a nobble on the end which, when I researched it at home, sounded more like the handle of a litten spoon, which were frequently cast in a copper alloy and in use from c1550 to c1650. It’s one for the FLO anyway, along with at least two of the buckles. It was a surprisingly warm day, with a clear sky and not a breath of wind, so I ended up shedding the fleece and detected in a t-shirt. I detected almost until sunset, when it was still warm enough (OK, about 10º C) for just the t-shirt. It’s strange how you get these odd really spring-like, almost early-summer, days in March.